I recently decided to try a new belt holster out so I decided to grab a Don Hume H721-OT from Gunner's Alley for my S&W M&P. The price was good and Don Hume has a good reputation in the shooting industry. 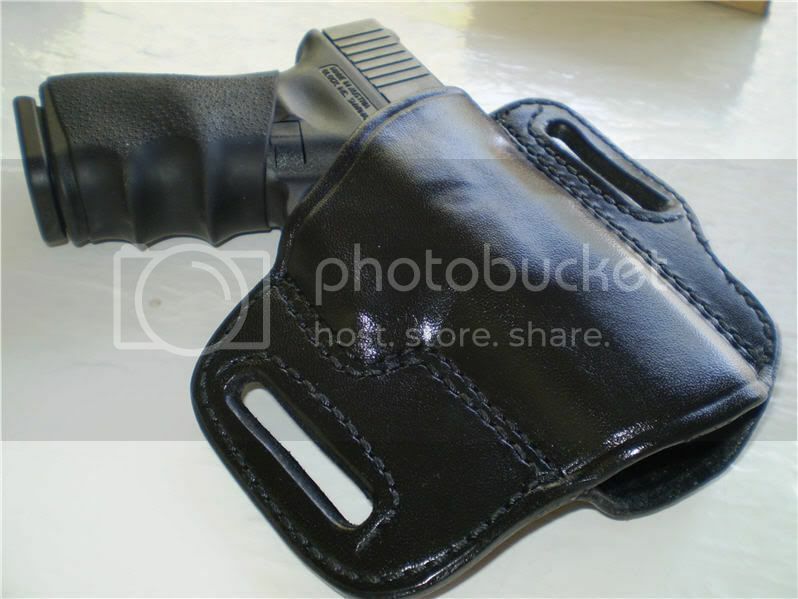 This holster is available in either a saddle brown color or black. I chose to go with the black model. Gunner's Alley shipped my holster almost immediately and I had it in 3 days or so. My first impressions were good. The holster looked to be form fitted to the weapon with fairly good construction. Hume makes holsters using a production line process (think car manufacturing), so the quality isn't what you will typically find in a custom maker like Milt Sparks or Josh Bulman. However, for the money invested, I was pleased with the overall quality. This holster rides a forward cant (although I don't think it's a true 15 degree cant), and the belt slots will fit any belt up to 1 3/4" wide. The H721-OT also has a bodyshield that does a decent job of protecting the wearer. Like any good holster, the M&P was very tight fitting at first and took some time to break-in. Once broken-in, I found the holster fairly easy to put on or take off. It concealed about as well as a holster of this type should. Not great, but not bad. I suspect that it would conceal better with a smaller handgun than the M&P. Make the holster in specific belt widths versus a "one size fits all" width. I'd much rather have one with 1.5 inch belt slots that match my 1.5 belt instead of 1.75 inch clots. Lose the semi-glossy finish - Although I liked the appearance, I didn't care for the semi-gloss finish that looks like it's sprayed on over the leather. Either handwax the finished product or create a manufacturing process that does that for you. Spraying some type of sealant or gloss doesn't seem to be a good business practice to me. Having had the holster for a few weeks now, I think it's a keeper. If your budget is in the $40 to $50 range, then this one might be an option for you. For starters, it's a thermoplastic holster so that may turn some individuals off. Priced at about $25.00, I was a little worried about the quality, and believed it might be in the same "class" as a Fobus or Uncle Mikes. I have to say that this holster kind of surprised me. The fit for the weapon was good. It sort of snaps in and seems to retain pretty well. The holster is open bottomed so it will really fit numerous other Glock weapons in the 9mm or .40 cal calibers. However, I most likely can't see myself utilizing this holster on any Glock larger than the 26 as I don't like a major amount of barrel sticking out beneath the holster. I truly like the dual straps that snapped onto the belt. This makes this holster really simple to get on and off. While it is not as fast like a paddle holster, this model is faster than the average belt holster. To be very honest, the holster looks cheap. I realize that performance is much a lot more essential than looks, but it still appears inexpensive. Although the retention seems pretty good, I'd love to see this holster offer some type of retention adjustment. Thinking about what I paid for this holster, I'm very pleased with the value, particularly thinking about it is only a few dollars more than a Fobus, but performs 10 times better. If you are looking for a fairly inexpensive holster that's easy to get on and off, then the Galco M7 Matrix may be one to consider.